I'm not usually one to follow the crowd, but as I saw people tweeting out their 'end-of-year' blog posts, I figured that it might be a good idea, even if just for selfish reasons. 2009 has been a transformative year for me. It has marked a complete shift in my professional life and as a result, my career has become more fulfilling and exciting. I did not accomplish all of this on my own. It was a slow progression, starting with the ISTE conference in June, when my world was expanded beyond my classroom, school and even district walls. June 27: My first day at NECC 09, a life-changing experience. July 11: I start to realized that my new Twitter and online world is taking over my life. Vicki Davis leaves a comment on my blog! July 16: I decide to make a plan to go "OTG" when I need to in order to find balance in my life. August 4: I reflect on my summer job that includes very little technology and I use Glogster for the first time. August 14: I reflect on my first #edchat experience. Little did I know that #edchat would take over the Twitterverse for educators! September 9: I realize and reflect on how important my PLN is to keeping me sane and to providing a strong community with which to learn and explore. September 12: I speak with Aparna Vashisht from Parentella about #edchat and connecting teachers with parents and vice versa. She later invites me to participate in the #140 character conference in LA, but I'm moving into my new house that weekend! September 25: Received my Masters degree diploma in the mail from Saint Joseph's University. Completed an Instructional Technology Specialist program. October 2: Shelly Terrell asks me to do a guest blog post on her blog, Teacher Reboot Camp. I write about Education in America. October 5: I close on my new house! October 9: A colleague and I take a group of students to a gallery to learn about David Kennedy, a Philadelphia artist from the 19th century. I realize afterwards how important it is to get students out into the real world and expose them to new experiences. October 20: I get my Google Wave account and begin playing around with Doug Peterson and Andrew Forgrave. October 21: I start a blog for our history project and make the first post. The response from my PLN astounds and excites my students. I start to realize how motivating writing in such a forum can be for students. November 2: I attend a meeting at the district's main offices and receive an iPod touch without being told why or how I'm to use it in the classroom. I also learn that I am infamous for my constant requests to have certain sites unblocked so I can use them. A lesson in poor technology planning and in being a squeaky wheel. Filtering issues start to look hopeful. Kind of. November 14: I attend my first BarCamp, which proves to be a perfect storm of social media. I connect with fellow educators Kevin Jarrett, Dan Callahan, Rob Rowe, Kristen Swanson and Ann Leaness through Twitter and GoogleWave. We use Google Docs to plan a session in a few hours and present it right before another Twitter colleague, Mike Ritzius and his fellow educators. We are now in the process of planning a education-focused BarCamp (EduCamp). November 23: One of my 6th grade classes video conferences with Gerardo Lazaro's 6th graders in Lima, Peru. Gerardo and I used Skype, Wikispaces and Google Chat to pull it off. Hurray Social Media! I see the power of communication across continents for my students. November 26: I sit next to the chief financial officer for the School District of Philadelphia and learn a few things about 'Us vs. Them' attitudes. I realized it's stupid to play the blame game when students' futures are at stake. 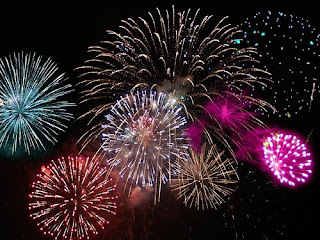 December 9: I learn that my blog has been nominated for an Edublog Award. I am thrilled, honored and humbled by the recognition. I also receive a challenge from my friend, Shelly Terrell to write about teachers who inspired me growing up. I immediately jump at the opportunity and send the challenge out to more friends and PLN members. December 10: I run a district-wide webinar on Social Bookmarking. A lot of teachers I 'know' through the district's tech listserv attend, and it has very positive feedback. I think: WOW, I have a PLN here in the district as well, how cool! I also think: WOW, I can't wait for the next one. I'm gonna sneak some Twitter people in, for sure! December 17: I hold a meeting with 15 other teachers in my building to put together for a plan to improve our school's climate. It is a wonderful meeting and I feel the power of teachers taking initiative rather than leaving decisions and actions up to administration. I create a Google Group to keep track of asynchronous discussions. 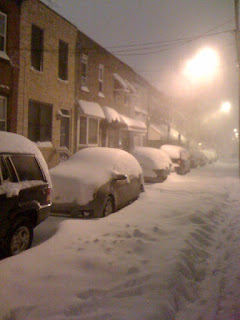 December 19: Mother Nature dumps 2 feet of snow on Philadelphia. I get a lesson in cooperation and teamwork. A new school isn't really a reason to feel sad, we needed it sorely. What is sad is the way the school culture has not improved, and may have even gotten worse in the temporary location. We have been practically taken over by the district and the region, teaching scripted programs for an hour and a half each day. Our teacher are disheartened, the recess yard and lunchroom are chaotic and, at times, hazardous, and students are often left unattended during the day due to support staff mismanagement. In addition, the Philadelphia Federation of Teachers (my union) announced, right before Winter Recess, that they are once again extending the contract. We have been working under an extended contract for over 2 years now. Then, Jerry Jordan, our union president makes a statement about the new Race to the Top program and how that will affect schools in Philadelphia. My school is already in corrective action---will we become a "Renaissance School," with 50% or more of the staff to be replaced along with the principal? Luckily my position as a lab teacher is an important one (everyone needs a lab teacher, right?) and the way I have made myself known this year throughout the district should make it easier for me to keep my job. In my personal life, I have had some transformative events as well. I bought a house and have spent this week making it more inhabitable. Today I am nursing bruised palms from scraping up tile from the basement floor. My friends all joke that owning a house is my 'grown-up card,' that now I'm officially a grown up. Sometimes, as I'm sitting in the house the thought: "Wow, this is MINE" passes through my mind. Do I feel like a grown up? Sometimes. Wait, is THIS what adulthood looks like? Looking back over 2009, I have grown up more than I could imagine. I have learned more this year than seems humanly possible. It is all thanks to the wonderful people I have met through Twitter and in my district who are innovative risk-takers, who take the bull by the horns and don't put up with bull. 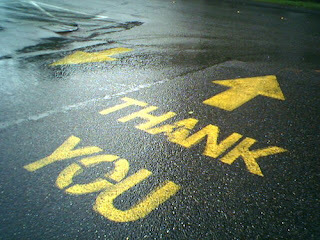 I am thankful for them coming into my life and I look forward to another great year in 2010. While I'm sure the learning curve will not be as steep as it was this past year, I am certain I will never stop learning and trying new things. I would also like to extend my gratitude to those of you who subscribe to this blog, whether you have participated in comments or not. When I started this blog almost exactly a year ago, I had no idea where it was going and I am elated that others are interested in my ramblings. Best wishes to everyone in 2010! Last month I had the amazing luck to receive a tweet from a fellow educator, Gerardo Lazaro, who teaches at St. George's College in Lima, Peru. He asked me if I was interested in doing an online collaboration project with his students. I immediately jumped at the opportunity. We weren't really sure exactly what kind of project we wanted to do, though we knew we would do it with 6th graders since he teaches middle school and the oldest students I teach are in 6th grade. Finally, after a few weeks of playing "Twitter tag," we found time to Skype and discuss an online video conference with our classes. During our 2 hour Skype session, we pulled together the whole plan. We were able to share our vision for the conference, share links and use his classroom wiki to do our planning. While Skyping, I pulled up his wiki on my computer by clicking on the link he provided in the Skype chat. I immediately clicked on the 'join' button and he approved me to begin editing the wiki. We had decided to have our students research a little about each others' city based around these four areas: History, Culture, Geography, Political and City. We split up the topics, each choosing one to edit. When we were done, I used an iframe code to embed the wiki page and project description we had created on his wiki into a page I created for the project on my wiki. When the whole thing was done and we signed off for the evening, I was blown away. In 2 hours we had planned a whole project and were ready to go for Monday. That is the power of social media. On Monday, we tested the last hurdle of the project: the actual video part of the conference. My district blocks Skype (apparently it 'does something' to our network), we couldn't get iChat to work because he doesn't have a Mac, we couldn't get AIM to work when we tried earlier in the week at work, or Oovoo either. Finally, my brain clicked: Google chat with video! We had used Google chat before to connect during the school day, so I knew it wasn't blocked. At 8am Monday morning, 4 hours before our meeting, we tested it out. It worked like a charm. At noon, my 6th grade class came down to the lab. I had arranged the room so that the iSight camera on my Macbook was trained on them, and I had the desktop microphone I had purchased earlier in the week ready to go. I called Gerardo up and there they were--a classroom of 6th graders smiling back at us. We started with the typical nervous laughter, smiles and waving, and we started asking each other questions based on some of the research that we had done on each others' cities. At one point our students danced for each other and we were able to show each other our favorite drinks (a purple drink for them and Coke for us). The students in Peru also got to describe some of their local cuisine, such as ceviche to our students, who named cheese steaks as their favorite. There were times when we couldn't hear each other well, and sometimes my students and I had trouble understanding his students' accents, but overall, it was a lot of fun! And surprisingly easy. Due to the Thanksgiving holiday, my students didn't have a lot of time to do research, but Gerardo's students were able to create presentations based on the research they did. Sadly, my students were never able to see them because the site Gerardo put the presentations up on is blocked by my district. As a side note, we had discussed the possibility of using VoiceThread to allow students to share their work and ideas, but that, too is blocked by my district. They were, however, able to leave comments on my project wiki page for the students in Lima to read. Unfortunately, it was the end of their school year (Peru is below the equator, so the seasons are opposite to ours), so we won't be able to plan another meeting for a while. Hopefully, by then, I will have better equipment and we will have more time to plan. We had also set up Twitter accounts for both of our schools (@Bluford_Elem and @SGC_Senior) in case we wanted to students to Tweet answers to each other. While that did not pan out due to planning limitations and my students' unfamiliarity with the Twitter format, it is has opened up that possibility in the future. I am also glad that I have a Twitter account for my school. I hope to be able to incorporate it into our parent communication and perhaps further communications with other teachers and schools. Now that I know how easy it is to plan such an event and even how fairly painless it is to pull it off, I look forward to similar experiences in the future with my students. I am talking with a Kindergarten teacher in my building about getting an author or another class connected with his. I hope to do more collaborative work within my school and hopefully with other schools. It is so important for my students to interact with people outside of their communities, as many of them rarely get a chance to do so (see my previous post on this). A friend of mine who is a lab teacher in Germantown (a section of Philadelphia) and are planning a video chat with our students. 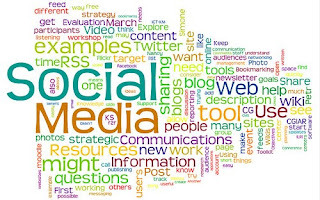 There are more social media tools I am hoping to use soon. I will begin using my Diigo teacher account with my 5th and 6th graders for the research project they have coming up in the spring. I have already tested it with one of my 6th graders who is working on a separate project, and she loved it. Hopefully tools like GlogsterEDU and VoiceThread will soon be unblocked so I can start using them! Feel free to share your experiences with connection across continents or ways you have used social media in your classroom! More Lessons in Teamwork: My Turn! As many of you are aware, this past weekend dumped nearly 2 feet of snow on the city of Philadelphia (23.4" was the final tally, I believe). The city barely plowed any of the streets aside from the main arteries. 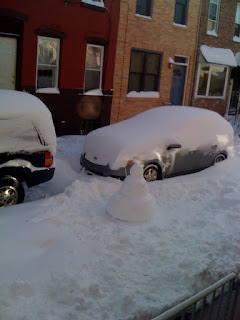 This left my tiny, dead end street blanketed and all of the cars on the block completely unmovable. Fortunately, today was a snow day, so I had time to work on getting the car out. Around 1:30pm, my friend and Twitter colleague, Mike Ritzius brought me a shovel to borrow. I immediately started digging, A few feet down the street my neighbor was shoveling her sidewalk. I started working on shoveling the street. I was set on shoveling a path for my car, even if it took me all day. 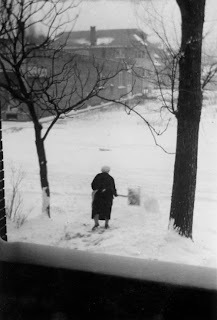 I gazed down the block, with its piles and piles of snow and while the task looked daunting, I had no choice. I HAD to get my car out! A few minutes later my neighbor came closer and asked, "So, what's your shoveling goal, here?" I told her that I was just trying to clear enough to get my car down the street. She offered to help. Within minutes, another neighbor came out with his shovel, saying "I just came to join the shoveling party." I responded, "And what a party it is!" The three of us got to work. About half an hour later, another neighbor came out to clear off her car and a few minutes after that, two more neighbors came out. While the one neighbor just lent us her shovel and some conversation, the other two started clearing toward the end of the block toward where we were. Before we knew it, the street was clear enough for me to start pulling my car out. As I neared the end of the block, feeling celebratory and proud, one of my neighbors signaled for me to open my window. "You're tire's flat," she told me. I got out to look. Sure enough, my tire was nearly flat. I couldn't believe it. We started unhooking my spare and searching for the jack. As we were searching, another neighbor pulled a tube through his basement window toward my car. It was an air compressor for car tires! He quickly filled my tire up and far as I know, it's fixed. A few moments earlier, another neighbor began backing his car into his usual spot at the end of the block, right by where I had stopped my car to check out the flat. We explained what had happened, and he waited while my tire was filled. Then, he pulled his car out of the way and let me take a spot on the adjoining street while he stopped traffic. I returned the favor as he backed into in the original spot. As I walked back toward my house, all I could think was, "wow, I live on the best block!" We've only lived here a little over 2 months. 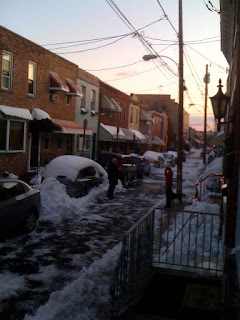 When I returned back to the block, I kept digging out the street with the newest shift of neighbors who had been inspired by our handiwork and were now digging out the unshoveled parts of the block and digging out their cars. "See what it takes to meet your neighbors?!" I joked. I finished the end of the block with two new members of our shoveling crew. At one point, one of the women on our block stuck her head out of her door with a bottle of white wine in her hand saying "thanks, guys, please take this!" We stuck the bottle in the snow to keep it cold while shoveling. At the end of the afternoon, I looked down the block, amazed at the hard work and teamwork that enabled us, as neighbors but complete strangers, to come together to accomplish a mutual goal. My neighbors and I pulled together in a time of need to help each other out when there was no one else to help us. We took charge and accomplished our goal while making new friends and getting to know each other better, building a closer community. Right now, the teachers in my school are in need of help and support, and it's not coming from above. Seems like we need to pick up our proverbial shovels and get down to the business of achieving our goals without waiting for help from the outside. In fact, I'm pretty sure that it's not just the teachers in my school. Teachers everywhere are struggling with the effects of high stakes testing, more demands without more time to fill them, the prospects of having their pay directly tied to how their students perform on state tests, and budget cuts creating shortages in materials, staff and basic needs. If you find yourself in such a seemingly no-win situation, I implore you to pick up your shovel. Chances are, there are others willing to help! This year I have been given the opportunity to work with a group of 13 proficient/advanced 1st and 2nd graders for a Reading Enrichment period every day for 45 minutes. At first, I grumbled and complained. I had at least 3-4 'behavior problems,' no lesson plans and no idea what the students' reading levels were or what I was expected to teach. I spent the first month experimenting with management techniques, procedures for meeting me in the IMC or at my lab (the students are not only in different grades, but in different classes). I experimented in what kinds of activities to do. I researched their reading levels on SchoolNet, I looked up the weekly standards in the Planning and Scheduling Timeline and planned accordingly. Slowly, as I realized through conversation with admins and coaches that no one was really monitoring what I was doing or seemed concerned with it (the rest of the school does a scripted Corrective Reading program during that time--I teach the kids who tested out of the program), I decided to take some freedoms. My students wrote stories, which they illustrated and read for a podcast. 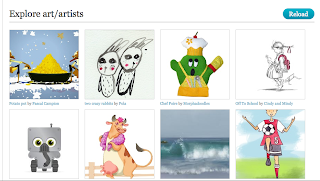 Now we are working on Storybird stories, many of which have been published. With such wonderful work being produced and such enthusiasm and motivation, I still had to put out little fires as students argued or teased each other. I decided, "Hey, no one really cares what I do with these students anyway...." so I decided to do some relationship and team building. We had read A Chair For My Mother by Vera Williams and discussed how the community had helped the little girl and her mother after their apartment caught fire. We wrote stories about people helping people. I figured it was time to do some helping ourselves. Over the weekend I bought a 100 piece puzzle and put it together. I broke it up into 4 parts, labeling the pieces in each part with either a number 1, 2, 3 or 4. I bagged up each group of numbered pieces in 4 separate bags. In class the next day, I broke the students into groups by having them count off into 4 groups. We reviewed best practices for working in groups (using kind words, being patient) and I reminded them that they would do their best work by working together as a team. Each group worked on putting their pieces together in preparation for putting the whole puzzle together. Three of the groups got right to work, without a hitch. I was beaming. The last group was struggling. One of the students didn't want to work with the students in his group. He was standing, watching, saying, "We need some of those kids in our group, they're almost done!" I told him, "J__, your group is not keeping up because they need your help! 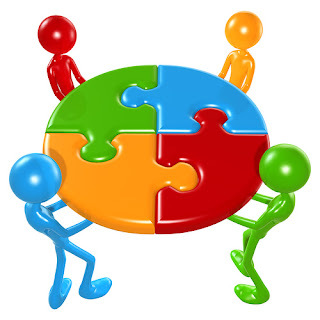 If you help them put the pieces together, you'll be done faster." He, unfortunately, did not 'get it,' and I had to get down on the floor and help his group. By the end of the period, we were still not finished, so I had to carefully pack the puzzle up for the next day. The students kept asking, "Are we working on our puzzle tomorrow?" The experience of working with their peers had been such a positive experience, they couldn't wait to do it again. The next day, each group took turns placing pieces in the puzzle to finish it. At the end, the students cheered and we all 'high-fived.' Sadly, the student who had not participated the puzzle activity the day before was absent, so he missed our success. I can't wait to show him the completed puzzle. I won't know until tomorrow and the next day whether this activity has helped pull us together as a group or whether it will make any difference in how my students treat each other. With all of the scripted program and testing pressure, there is little time in their 'regular' classrooms for this kind of activity. I hope it makes a difference! Just recently, I received a tweet from my friend Shelly Terrell who 'tagged' me in her post about educators who have influenced her as a teacher, challenging me to reflect on my own teachers. I have named this post after hers: Lessons Learned from Great Educator. The first teacher that I had was my grandmother. She ran a Montessori school in the suburbs of New York City where I grew up. My Montessori beginnings definitely helped mold me as a learner. I learned through exploration and social interaction. Those lessons continued as I spent my summers with her, my grandfather and two cousins on Nantucket Island as a child. We spent our afternoons exploring the beaches, digging hot tubs in the sand and reading a collection of photo-laden encyclopedias. The next teacher I remember was my Kindergarten teacher, Betty Raden (I don't know if I spelled her name correctly, it was a while ago.). We wrote in our journals every day, we spent a week in a homemade cardboard town with everyone working a different job every day. I think I remember working in the post office, delivering letters that my classmates had written. My parents and I stopped by an appliance store to get some big boxes to help build the city. We also raised Monarch butterflies in the spring, watching our eggs hatch and our caterpillars change into butterflies, drawing and writing about the changes. 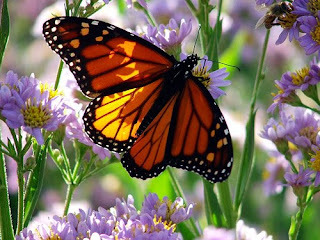 When they hatched, we had a butterfly room, which was in the corner of the classroom. We could walk inside and feed the butterflies. Then, they were tagged and set free to migrate to the South. Most students didn't like Mrs. Wittenberg. She made you WORK. I had her for 8th grade Global Studies and 9th grade English. She lectured us on the culture, traditions, history and politics of every corner of the world and taught us how to build a well-organized essay that addressed all aspects of the topic at hand. In English class, she gave us a choice of how to show what we had learned (such as a movie poster). She handed out a rubric at the beginning of the assignment, then had us fill it out to hand in with our work. She would also fill one out so we could see how accurately we had graded ourselves. My biggest lesson that I learned from her, however, is one that I describe to my students every year. We were assigned to write a research paper about any topic we wanted. I chose acid rain. I spent weeks doing the research and writing the essay. I thought it was pretty great. When I got my essay back, it said "See Me" in big red letters. Turns out, I had plagiarized nearly all of my essay. She made me stay after school to sit with her and rewrite half of the essay. I was able to resubmit it and though I don't remember the grade (maybe it was a B+?) it was the best lesson I've ever had in restating facts in my own words. She was patient with me and took the time to make the best of a 'teachable moment' when another teacher might have failed me without such dedication to her student. The most influential part of my high school experience was my senior year in the Walkabout program. 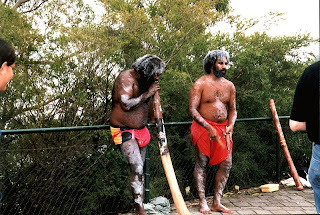 The program was based on a rite of passage for young Aborigines. In my junior year I applied for the program, which was designed for high school seniors who were either in risk of failing or looking for something more out of high school, and was accepted. I had been taking mostly AP and advanced courses, was yearbook editor and a member of a few clubs, and was pretty much bored with what high school had to offer. In September, myself and about 25 other students from around Westchester County, NY found ourselves in a building on the BOCES campus in Yorktown with no idea what was in store for us. Our year began with a week-long backpacking trip in the Catskills--carrying our food, tents and water with us--and progressed to a 4-week Community Service project. We reported to our C.S. location 4 days a week for a full day, reporting to school only on Mondays for classes and reflection. Next, came the 6-week Internship and extensive training in resume creation, interviewing skills and a lot of phone calls ending in rejection. I was able to land 2 internships, splitting my 4 days 'in the field' between Vibe magazine and YM magazine. On Monday, I went to class and reflected on my experiences during the week. I did this all before my 18th birthday. Our year concluded with another week-long backpacking trip, this time in the Adirondacks, and a graduation unlike anything I'd ever been to. The graduations were spanned over 2 nights, with every student standing in front of their friends and family talking about their year, their accomplishments, their fears and their dreams. I don't even remember my 'real' high school graduation---except that I wore a pink skirt that I made myself and probably sneakers. I was, at that point, 'beyond high school.' I don't understand why this kind of program isn't available to all seniors. It is the ultimate preparation for adult life. It is no secret to me that my own past education experiences have influenced my teaching style. In grades K-3 I did nothing but project based learning. I completed many hands-on projects and I was given freedom in what I chose to study. I find that much of my teaching reflects this philosophy. I tend to lean toward projects that span a few weeks to a month, and I always try to give my students some kind of choice in completing the assignment. I use rubrics extensively and make them available to my students when we start the project and throughout the project. I also take the time to teach my students about copyright and plagiarism, and I try not to miss 'teachable moments' when I see a misconception or a student struggling with an assignment. I am aware that my experience is exceptional and that I have been blessed with a handful of wonderful teachers and varied, alternative learning experiences. I know how much this kind of education meant to me and how it helped me become the adult I am today. This is why it saddens me to no end to watch my students stuck in classrooms with scripted, direct instruction lessons, curriculum timelines that require teachers to move on, and subjects taught in isolation with no real world application or student choice. I see students' curiosity stifled, their motivation hindered and their love of learning crushed at a young age. Learning was fun and relevant for me as a child. When you take the blocks and social play out of Kindergarten, and you teach standardized test skills to 1st graders, you've already begun the process of taking away a child's natural curiosity and need for exploration. So I'm tagging some fellow bloggers to reflect on teachers they've had that have influenced their teaching and personal lives. Andrew Forgrave, Chad Sansing, Deven Black, Beth Still, and Kelly Hines and Ryan Wassink I have tagged you in this post, but please do not feel pressured. I respect your blogs and your work as educators, and wanted to extend this challenge to you. Please link back to Shelly's original post (see above) in your post, as it is she who started the challenge! Please leave a link to your post in the comments so that we can read them! I am SO honored and thrilled to have been nominated for an Edublog Award. When I first started this blog almost exactly a year ago, I really had no idea where it would go and I had no plan, really. After reading more blogs and building my PLN, my blog has grown as I have grown professionally. It is a reflection of what the inspirational and supportive educators I have met over the last year have taught me. Please stop by the Edublog Awards site to vote. It is a list that everyone should keep close at hand. While I have known about Storybird for months now from Twitter, I finally was able to put it in the hands of my students. And boy, did they run with it! Storybird is a Web 2.0 tool that allows anyone to create an online storybook. First, you choose the artwork by choosing an artist. There is a wide variety of styles and mediums as well as art that is both kid and adult friendly. Next, you begin dragging pictures of your choice to the 'paper,' adding words and a cover. As of now I don't see any page limit. Some of my students already have 10 pages in their stories. Storybird automatically saves your work every few minutes, even if you are not logged in. In order to publish or come back to your story later, you need to create an account, but it is pretty simple and does not ask for a lot of information. Storybird has been transformative for my students' writing. We started writing stories on paper about a month or so ago, with the rough draft, editing and rewrite. Their stories were well structured, but they had trouble starting off with an idea. They also groaned every time they had to rewrite the same story with the editing changes. They groaned even louder when I asked them to draw pictures. Now, they can easily go back and edit their stories or add pages, I can go through and edit on the spot with them, and their inspiration comes from the wonderful artwork. They can't wait to log in and get back to their stories. As a lab teacher who sees around 500 students a week, I have to make things simple, so I created an account for each class. Each class logs in with a universal account and then they put their name on their story cover to identify themselves as the author. So far it has worked like a charm, and I have not had any problems with students working on stories other than their own. What I also love about Storybird is the way it forces students to tie their words to their pictures. It also forces them to use their imaginations to tie the images together to create a story. In addition, the idea of writing for an authentic audience motivates them to take their time with their stories and it gives them a real reason write, aside from pleasing the teacher. When I created podcast of some stories they wrote earlier in the month, they would sit and listen to/watch the stories over and over, exclaiming "I'm reading your story right now!" to each other. As an avid writer and former art student, I am a firm believer in students learning how to illustrate their work. However, I watched so many of my students get frustrated and struggle with illustrations that it took away from the writing process. I look forward to using this tool with my 3rd graders to produce more in depth and involved stories.